This post is in response to a question that someone asked. 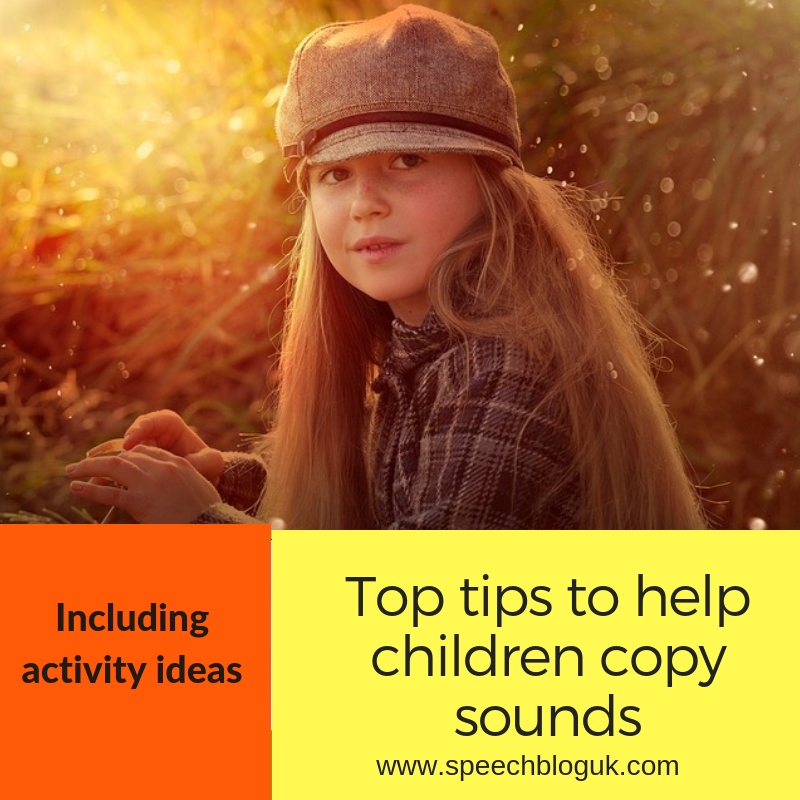 We had an email from someone on our mailing list who asked how they could encourage their child to imitate speech sounds. Here are some ideas. Start by copying them. 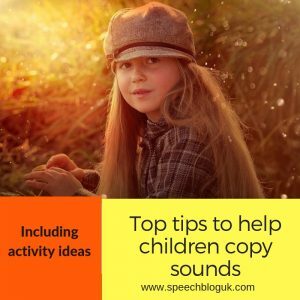 Copy what your child does and the sounds that they make. This is something we often naturally do with babies – we copy back their babbled sounds. However, as kids get older we often stop doing it. Start by copying what they are doing with toys and move on to copying the sounds they make. Practise general copying. Play other games where you copy each other. Pull silly faces at each other in a mirror and see if your child will copy you. Copy their faces too. Copy each other moving around the garden, jumping, doing silly movements, blowing raspberries etc. Just play around having fun and copying each other. Every now and again add a sound in with one of your faces or movements and see if your child will copy that too. Suddenly the pressure is off and it’s just a game of making each other do silly things. You may be surprised at what they can do. Make sounds during play. Take any opportunity to make sounds as you are playing with your child. For example, make all the trains say “ch…ch…ch…ch”, or while you are pretending to fry sausages say “ssss”. Don’t ask your child to make the sounds, but just say them each time you do this thing. 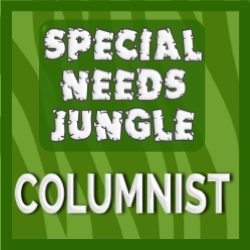 They don’t all have to be speech sounds, just any kind of sound you can make with your mouth. For example, I always make a creaking sound when I open the door of my toy postbox. Occasionally, do the action with the toy but don’t make the sound. See if your child will fill in the gap. You may find they start trying the sound when they are playing with the toy themselves. Don’t ask them to perform. Don’t ask your child to perform for family and friends by saying different sounds and words. It tends to make the child feel under pressure and they are less likely to do it. It is not motivating for the child and it is not communicative. Also, being able to repeat a sound or word is a very different skill from being able to say it to communicate something. Eventually, your child will be ready to try imitating some sounds in a slightly more formal way. Here are some tips for how to do this. Praise all attempts. When I do an assessment with a child whose speech is unclear, I often ask them to imitate some sounds back at the end. They are often reluctant to try. Once I have managed to persuade them to have a go, I say “well done, great try”, no matter how far their attempt was from the target sound. Often you can see the child visibly relax. They are often aware that they find it difficult. It’s brave of them to have a go at something they think they won’t succeed at. Acknowledge that they have tried their best and praise them for it. The more they try, the clearer it will get. Get eye contact with your child. Watching someone else saying a sound as well as listening really helps to be able to say it more clearly. Get on the floor with your child so you are at eye level. Wait for them to look at you before making the sound. There are more tips on encouraging eye contact with children whose speech is unclear in this post. Reward them for trying. Play a game while doing it. When we are repeating sounds in therapy sessions, we always play a game while we are doing it. For example, we might blow some bubbles after each attempt or stamp a stamper on some paper or put a piece into a puzzle – whatever they enjoy! If the activity is fun enough, they will often be happy to have a try. Practise easy sounds not just hard ones. No-one wants to do things that are tricky all the time. Keep your child’s confidence up by asking them to say sounds you know they can say well, and try the tricky ones every 3rd or 4th sound. Praise the easy sounds too. 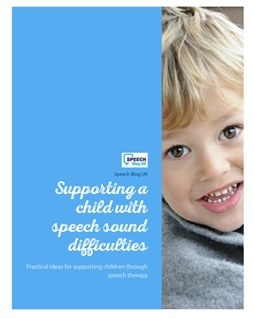 What other tricks and tips do you use to encourage children to imitate speech sounds?